I wanted to say thank you for helping me put aspects of my life into perspective. After dealing with traumas I had nowhere to turn and stumbled upon Your Soul’s Plan. It is with this new knowledge and your expertise and wonderful reading that after 2 very dark years I was able to see some light and I am hopeful for the future again. One of my biggest challenges was processing my brother’s death and so many unanswered questions. Right away you helped me connect with him — something I never imagined I could do. After our Soul Plan Reading yesterday, I sat for a long time, just blown away. I have spent all my life searching for the reason I chose to be born into a seeming lifetime of abuse. I felt such a great shift…you were so very, very thorough. Thank you for taking the time to share your experiences with me in order for me to understand my own chosen destiny and how to balance it out this lifetime. Corbie, you blew me away with those very colorful depictions of my seven previous lifetimes I saw that I brought with me many, many of the traits from previous lifetimes and why. I love the perspective you have brought to my life of suffering. I woke up this morning, waiting for the usual flood of anxiety and fear…but nothing! I felt light and stress-free. I think my true healing has just begun. I cannot thank you enough; I’m so glad I chose to have a Soul Plan reading. Your thorough past life reading relates very much to my current life patterns. I have a better sense of the way in which these two life-plays are interwoven, and where some of my “stuff” is rooted. I appreciate all the time you invested in this effort. I also appreciate your personal manner and style. You were compassionate and sensitive to my needs and you offered me various options that I am able to pursue in my quest to transform my life. I am most grateful. Having time to think about my Soul Plan reading and reflect back on it, I feel strongly that it was well worth the money and time spent. My life is calmer and more peaceful as a result of my reading. The tremendous insight provided was well worth its weight in gold. My heart has opened even deeper with compassion for those who have been involved with my life, especially the various key people discussed in my Life Challenges. Very rarely does one get the opportunity to work with a very gifted psychic and I’m thankful for having connected with you. During my Soul Plan reading, Corbie gave me four detailed readings on past lives that I had with my parents. What fun it was to share these stories with my mother and father — we are so grateful! For me, the best part was when she channeled my Higher Self. The council was so wise and loving. A fantastic experience! I needed to hear everything that came from my Soul Plan reading and it came at the perfect time. This is without a doubt one of my most treasured experiences on my journey of awakening. I feel so very blessed to have met Corbie and so grateful for the powerful and amazing reading. Thank you so much, Corbie! I was very pleased with the Soul Plan session; it filled in many blanks I’ve had about the past. Your ability to transmit messages is so clear and you do it with compassion. My reading has cast new light on a lot of the murkiness…for those who are considering a Soul Plan reading, I can say from experience that the insights that come through will deepen your understanding of your life’s goals and empower you with the knowledge that this life and its challenges are your choice. Knowing this changes everything. Corbie is down to earth, insightful and at no point in our reading was I anything but at ease with her gentle spirit. So very inspired by universal energy, past lives, levels of creation, and my soul purpose. Much thanks for your gusto, shared experience, skill and energy. Thank you so much for the Soul Plan reading. Initially I am left feeling the freedom to be myself, and that is so helpful. I breathe a little deeper. I see in my immediate life where I can allow the patient wisdom for everyone around me to be exactly where they are in their evolution-soul growth. And wonderfully, every day presents opportunities for me to learn my much needed next steps. I’m sure I will be digesting your information over time, as I listen to the recording again and again. You offer a wonderful service. I appreciate the time, hard work and discipline it has taken for you to have come to this level of clarity with your gifts and talents. You provide a supportive environment for a person to receive your much needed insights! You told me of my past life in World War Two. My Dad fought in World War Two, so I thought it was my interest. I was also told that I hid photos and items then, and I have always felt the need to protect family photos, and that ifs I ever had a fire, those are the things I should save. Amazing. The Soul Plan reading exceeded my expectations. Please know of my gratitude for your thorough investigation into the life challenge that I outlined for you in my homework. I am immensely thankful for the life-enhancing information you were able to bring through, which I know will continue to help me make meaning out of the past and accelerate my purpose as I move into the future. With deepest appreciation for using your gifts to assist my “Soul Plan” understanding. I look forward to reviewing the recording of our session. May you continue to enjoy abundant blessings. You really gave me clarity about the various lives I’ve had with my son. Thank you, thank you, thank you! I wanted to follow up with our Soul Plan session and tell you how much inspiration the reading has given me. I had felt really stuck emotionally for several years in my current life. I didn’t know how to move forward. This is not normally me — I always have had a game plan, too many ideas and never enough time. But somehow that focus had left me. After finding the book YOUR SOUL’S PLAN I knew I had to talk with you immediately. The reading you gave me really answered many, many life questions for me, and the new information for my future was so powerful. The very next day, new inspiration came to me and a happiness I hadn’t felt in years. That happiness and focus has remained with me ever since, and I am now moving forward. Thank you for such a lovely gift. Most of my life I always knew I was in Europe in World War II but I didn’t know where. I knew I died there. You retrieved for me the life I needed most. You have no idea what you just did for me. Thank you! I had a Soul Plan reading with Corbie and it was incredibly insightful and helpful. Corbie took the time to look into the past lives that related to the issue I am dealing with now, and she explained, with much patience and compassion, the connections between those lives and my current challenge. She was also able to help me communicate with my Higher Self to ask direct questions, and this part of the session was also helpful. I came away with a deeper understanding of the issues I’m currently dealing with as well as what I’m trying to learn during this lifetime. Corbie has a lovely sense of humor and it is a pleasure to work with her. I highly recommend her services. I have always wanted to be knowledgable about my past lives, but despite many meditations I’ve never seen anything. This session gave me a tool to use to help me continue seeking and learning. This past life reading was very helpful. It would explain why I feel animals understanding me when I look into their eyes. I sometimes feel I can feel what they are feeling. Thank you so much. I have a much better understanding of my life now. I am pleased to say that my Soul Plan reading was very uplifting in that it enabled me to see the pattern in my incarnations that I have to deal with now. More importantly, it gave me a strong sense of self-worth seeing that I had a past history of serving and caring for others. I was most impressed with the description of my last life, which was confirmation of a reading I received over 12 years ago from another psychic. It could not have been possible to have known about this information otherwise. I would recommend Corbie to anyone who feels that there are issues to be revealed and resolved that cannot be explained by present life experiences. My head spun for two days after my reading, but it was glorious. I’m still on a high. I just feel so confident — exactly what I needed. I can see so many reasons why those four lives were chosen for me to be unveiled. When we hung up from my session, I bawled my eyes out. One, because I understood that “I AM GOOD.” It’s such a simple thing, but I’m sure I’ve ever believed it. Always waiting for the other shoe to drop. I felt more like “I am cursed.” But now I see. And it’s magnificent. Two, I asked for confirmation and I got confirmation. These four lives I led before weren’t able to go as far as they wanted to go in their plights, but I think I can. And I want to do that — for me and for them and for others. There are several other dots I connected which provide me with much comfort and confidence — things that allowed me to accept myself and the decisions I made. Just awesome. I am so grateful for the energy that you poured into my reading, and I’m grateful for the way that you shared yourself as well. Your gift, your perspective, your openness, your delivery…such blessings. Thank you. What a huge difference my Soul Plan reading has made in my life. Now I understand why events occurred as they did and feel it to be true on a very deep level. My response to the events has literally flipped from anger and victimhood to a place of forgiveness where healing has begun. A lot of space has been opened up. I feel as if a curse has been lifted. This shift occurred quickly during the time of the reading. Thank you so much. Thank you so much for the amazing and transformative reading last evening. I was so energized after the session! The information you provided me about my best friend and long-time soulmate was so spot on, and will help us both going forward as we continue to grow and support each other. As fore your telling of my past life with my current younger daughter, all the questions I had about the conflicts we had surrounding her adoption were resolved, and a great emotional burden was lifted. Your reading has impacted me not only in my personal life, but greatly at work: with new insights I will be able to forge on with less stress and more purpose. Thank you again and I look forward to our next session. Thank you so much for the last life confirmation! I have a constant “buzz” in my head: Mind Over Matter. The lives you found just proved that the words I hear are right. It’s interesting, what you said about hands and feet being cold: almost always, even on many warm days, I’m one of those people who can have a heater on in July. And it’s fascinating about the herbalist life; I do have a lot of stomach issues — maybe it’s the leftover cell memory. And I’m still interested in medicine (I work in a hospital), though more from a holistic/mental health point of view than transitional. Corbie’s reading of a past life involving very important people in my current life was incredibly detailed and helped to explain the dynamics on current relationships in a way that would not be possible otherwise. She has a divine gift to be able to bring such invaluable insight into our lives, while she is authentic and down-to-earth. Her reading has altered my perspective of my relationships — and, as a result, I am able to distance myself from easily from deep emotional pain. I have suspectd for several months now that it was God who has been leading me from a place of godlessness to a place of God awareness. With each step I begin to see, with increasing clarity, that there is a divinely ordered plan to my life. What a powerful experience it was to be able to put form and meaning to a life which until quite recently I viewed as a failure. Corbie, I know that when you channel you serve as a conduit and do not hear the conversation. I will tell you that there was a divine elegance and wisdom in the message I received, but above ALL, the expression of love and acceptance was to me like rain on dry ground. I will confess my eyes fill with tears each time I listen to the recording of our session. I thank you for your participation in a session which spoke to both intellect and heart. Thank you Corbie! This is amazing. It’s really cool how your words resonate with me. It’s wonderful to have a glimpse like this into the past events and soul lessons that I have gained. A life in the 8th century? Wow, I’m old. What a perfect time to come one step closer to Enlightenment. Thank you again. “Illuminating” is the first word that I used to describe my Soul Plan reading with Corbie. Her emotional base of operations is as a joyful empathic friend who possesses down-to-earth human experience, wisdom and warmth. With this as her foundation, she simultaneously connects with and translates the higher energy of the Soul. Laughter, goose bumps spellbound in silence, and tears were a few of my reactions to the insights flowing through her. Not only did I find the content of the information coming from Corbie to be highly personal, up-to-date and relevant, her style of delivery is most fascinating. For when she channels the Higher Self, her words flow in beautiful poetic cadence. The resonance shared has a tranquilizing effect upon the listener that is both healing and transcendental. I sense that Corbie cannot help but “tell it ilike it is”… for it is simply part of her bold intuitional nature. I also feel that Corbie’s deep humanity and specialized abilities have her on a “mission” to help clarify and activate a person’s greatest potentials. I had a session with Rev. Corbie a few weeks ago and I cannot even begin to thank her enough. She has remarkable psychic and personal insight and tremendous compassion. In one session my life, issues and personality are explained to me in a way that helps me on my path to spiritual growth. “Wow” is all I can say. 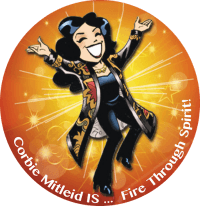 I recently had a Soul Plan reading with Corbie. I didn’t know exactly what to expect, and I am still processing the information she gave me. Her information about my relationship with my adopted daughter brought tears to my eyes. It was very gratifying to learn something about our past history, and to know that I had set out to accomplish something with her and for her in this life, which has been done. There was much other information that I am sure I will be pondering for years to come. I am happy to recommend Corbie’s services.